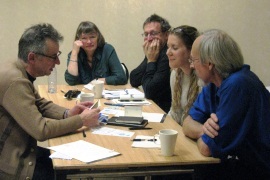 Fortified by coffee and biscuits, twenty writers attended a workshop entitled Drawing out the Creativity with John Hegley at the Douglas Hotel in Aberdeen. He interspersed the workshop with some of his own poems and songs and his description as one of the country's most innovative comic poets was clearly well deserved. The workshop began with a drawing exercise as we were asked to produce a portrait of the person sitting next to us (some were more recognisable than others!) 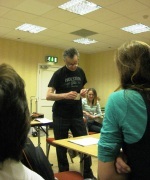 We then had to write a short piece about something we were willing to lend to John Hegley — a bus pass, a battery, a watch and a packet of colouring pencils were some of the items featured. Participants were then encouraged to write about a number of themes starting with the letters A to G. Five of the themes were stipulated, namely About Me, Beliefs, Choices, Dear to Me and Goodbye, with a free choice of subjects beginning with the letters E and F.
There was humour and creativity in abundance as participants shared their hastily-penned poems and prose on subjects ranging from cake preferences and pets to family history. This inspiring workshop ended with a question and answer session and it was a real privilege to spend time with such a successful writer and performer. 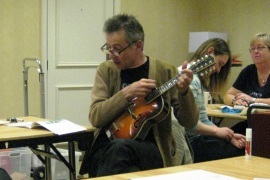 For those of you who missed the John Hegley workshop Drawing out the Creativity with the Lemon Tree Writers at the Douglas Hotel on 23 May 2009, you should be disappointed. 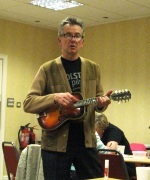 This Wordfringe event began (of course) with a song from Hegley, a master of improvisation, about how it was time for us to begin, and his music, on that little guitar-like instrument I never did get the name of (I think he called it Stephen when asked) accompanied us throughout. This was more than a little distracting but lent a certain atmosphere. To shelter you from rain. But its loss would be a pain. A bit flippant, really, compared with some surprisingly touching little poems from others in the group, telling their stories about the objects. Then, in the quickest two hours I may ever have passed, I wrote a book. Well, a mini-booklet, but it's a start. There was a bit of origami to begin with, making the pages themselves. Then we drew portraits, passing our booklets to the next person so we could see ourselves as others saw us. Oh dear. Hegley showed how writing can be fun and accessible. With him, a simple piece of paper became a set of oblongs, a tent, a diamond, a book. Words were to be played with. Drawing was encouraged. At the end, we sticky-starred each other's best pieces. When asked if it was all about humour with him, Hegley replied that sometimes the saddest things can be said in a funny way. So, what did I take away from the workshop, apart from a dubious yet inspiring little work of art? I felt a sense of motivation. A feeling of something shared, after hearing some of the work read out, and having had the privilege of dipping into other booklets. I also now have the impression that perhaps Luton really is more interesting than London.